Dr. Thomas DeLiberto, national wildlife disease coordinator of Animal Plant Health Inspection Service of US Department of Agriculture (USDA), visited XTBG during Oct.3-5. Prof. Zhu Jiang and Prof. He Hongxue accompanied the tour. 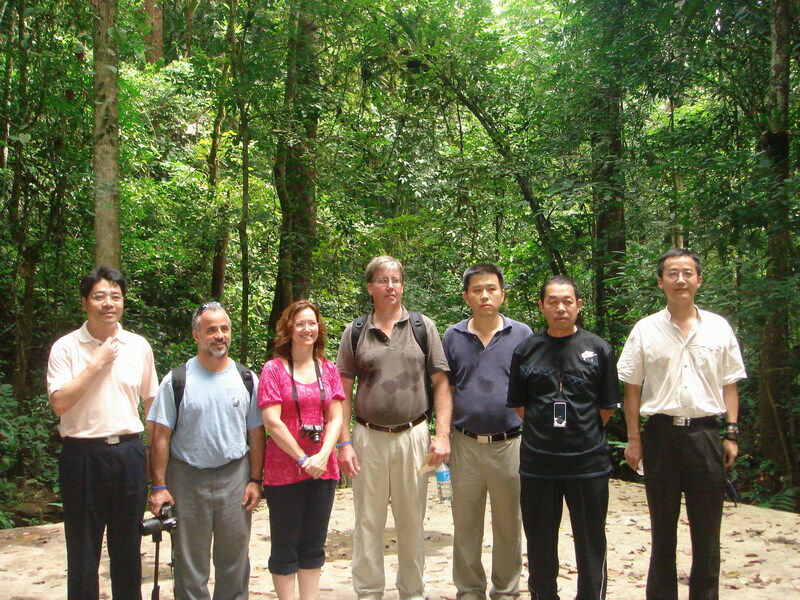 Dr. Hu Huabin showed the guests around the Garden, and accompanied field tours to Ganlanba, Bubeng and Mohan. Dr. Chen Jin, director of XTBG, exchanged ideas with the visiting experts and asked Sawat Sanitjan, a foreign Ph.D candidate at XTBG, to accompany field visits. Due to the epidemic of SARS and bird flu in recent years, <?xml:namespace prefix = st1 ns = "urn:schemas-microsoft-com:office:smarttags" />China and USA has deepened cooperation in research and monitoring. The object of the visit is to survey the situation of water birds and migratory birds in Xishuangbanna.